Newfangled is a 3D Building pioneer. 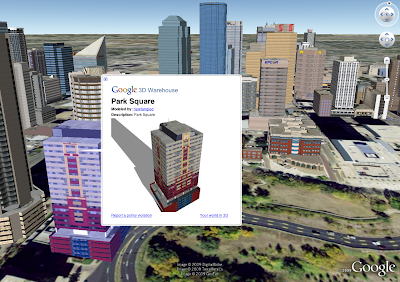 From the earliest days of modeling with SketchUp for Google Earth, Christian (aka "Newfangled") started creating the buildings in his home town of Edmonton, Alberta in the Great North of Canada. In fact, part of his motivation for modeling was to put North America's most northern city on the map. 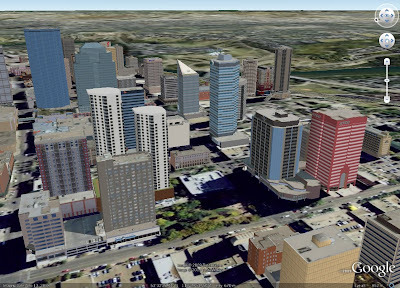 To date, he has placed over 150 models in the 3D building layer of Google Earth and Edmonton's metropolitan status is easy to see. "I got started after a trip I took to Calgary," Christian said, "I was actually looking for a place for dinner, and when I searched in Google Earth all these buildings started popping up. I thought it would be cool to have the same thing in Edmonton. I actually got in contact with IntoTheWest, who put up the buildings in Calgary." You may remember that Andrew (aka "IntotheWest") was our first Featured Modeler. "The first model I created was my apartment building," Christian continued, "and once that was done I realized how easy it was and started doing the surrounding buildings. I walk to work, so I took pictures along the way, modeled those buildings, and from there I figured I might as well do the whole downtown." Having Edmonton on the map remains a prime motivator for Christian, but he also enjoys the process of modeling in its own right. "It's relaxing. I'm a Gen-Y guy, so a lot of my friends play XBox or World of Warcraft, but what I do for fun is make buildings." Christian is a mechanical engineer so he was familiar with CAD before he got started. After watching some of our online video tutorials and getting some hands-on practice, he was up and running. "I picked up SketchUp pretty quickly. And once I got the hang of taking pictures that would make good textures, the process was pretty smooth, although some of my earliest buildings make me cringe a little now. Getting around trees and power lines with the camera isn't easy, so I use GIMP (a free image manipulation tool) to edit the photos before I apply them to my models in SketchUp. And I also use repeating textures to cover tall buildings." In addition to modeling Edmonton as it exists today, Christian has begun reconstructing historic locations. "I like the idea that I can reconstruct something that is no longer there. Using historic information I am able to bring buildings back to life." 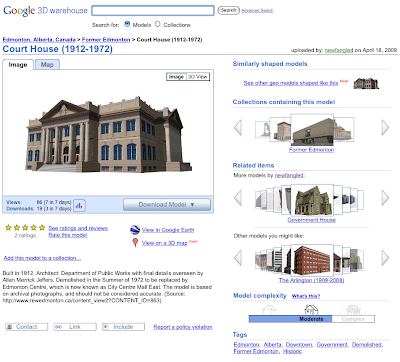 His collection on Historic Edmonton can be found on the Google 3D Warehouse. Along with a collection of proposed structures in his Future Edmonton set. 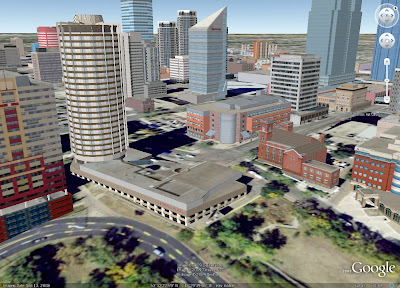 "You guys should allow Google Earth to show past, future in addition to current buildings." He's right, we should. "Recently I completed a local River Boat attraction and our Convention Center. It's great that someone planning a trip here could do a search and get informed about what's around." Christian is planning to keep on building, in fact, the mission statement on his blog is "Edmonton - one building at a time... Or maybe sometimes two."